Some books inspire me to write reviews, other books inspire me to design clothes off the characters, and even more books inspire me to just sit there at stare at my Kindle dumbly. The Dancing Master, however, is the only book (so far) that has ever led to me to write a letter, and to the author no less. I just wanted to mention how thrilled I was by your last book, The Tutor’s Daughter, and how eager I was to read this one when it came out. I’ve read all but one of your books, and out of those, only for two of them (including this one) have I ever given less than 5 stars. You’ll understand my surprise when I was granted an ARC by Bethany House Publishers. I recall that I started in on the book on almost the same day I downloaded it. I think hope you’ll also understand my shock/unease when this book turned out to be very different from the others. For one, instead of the strong-minded fellows you usually included in your books, Alec was, well, he was a dancing master. Is there anything more I need to say. I liked him as a person; he was kind and considerate, cautious with young ladies who could take advantage of him, unafraid to take his place as “man of the house” and to defend the ones he loves, etc. But…he couldn’t fight. And he wasn’t as Christian as several of your other gentlemen. And – I know this is biased of me, so forgive me – he couldn’t fight. When the wrestling duo came upon him and could have kicked him to death, he lay there on the ground until an unknown man with a gun came to save him. Yes, Alec had wits and courage, and even some amazing fencing skills, but I must admit there’s just something so ruggedly handsome about hand-to-hand combat. Now, about Julia. She was unlike any female heroines of yours I’ve ever known. All your heroines are vastly different, but they all fall easily in love and have a special gentleness to them. This may just be me, but I cannot say the same for Miss Midwinter. I recognized her vulnerability later on in the book, but overall she was too outspoken and none too gentle for my delicate sensibilites;) The extreme lengths of flirting she was prone to also didn’t help her cause. I completely grasp why Julia is all the things she is, but it still doesn’t make me love her. I liked her well enough in the second half of the book though, when she learned the truth – about her, Lady Amelia, and the reason dancing isn’t allowed in Devonshire – and became an overall better person. I fancy Alec saw that character buried within her from the very beginning, and that is the part of her he first fell in love with. The pacing was a very troubling aspect of the novel for me. Usually I can easily finish your books within a day, but with this one, it took me from January 1st to the 10th. In the beginning, I’ll admit that I thought that you, one of the greatest christian romance writers, had lost your touch. 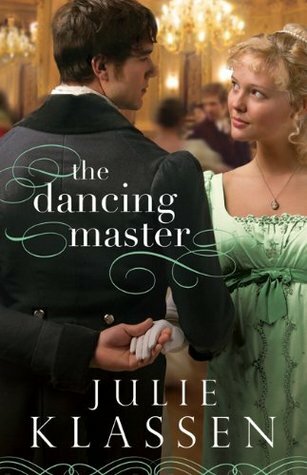 But as I kept on reading, The Dancing Master first got tolerable, then intriguing, and finally downright pleasing. And I have to say, I loved your ending by the way. That was pure genius. I suppose the reason I didn’t appreciate the first few chapters was because there was lots of world-building, introductions to characters, and my favorite, possibilities of scandal. Then there were the first meetings and the first perceptions. It was only after that that I was able to fully enjoy the book. Not as much as many of the others, but still very much. I believe it takes a lot of effort to write a book like this, and for that, Mrs. Klassen, I must applaud you. I hope I don’t offend, but I feel it is imperative that I also laud everyone who kept reading past the boring starting chapters and made it to the true prize inside. Bravo! After pouring all my thoughts out into this letter, I think that all I really wanted to do was to explain the uniqueness of this book compared to the previous few, as well as concede that I judged the novel too harshly at first. I just want to make sure it’s understood that while this wasn’t the easiest story to get into, after I did, I find that I can never regret reading this book (ignoring the fact it means I haven’t DNFed a book yet). I’m looking forward to reading The Apothecary’s Daughter some day, and hope fervently that your next book, if you grace us readers by writing one, will have a plot that starts off more quickly and contains, um, a more involved romance.